In the wake of France’s recent presidential elections, a study reveals there might be a “black market” of political bots lurking under the surface. Some of the bot accounts which spread disinformation during these elections were also involved in the 2016 U.S. presidential race. 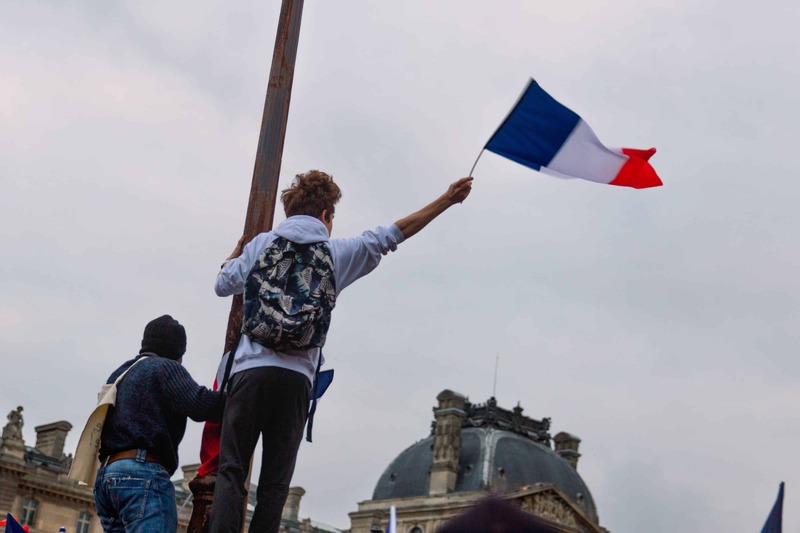 A young boy waves a French flag at The Louvre shortly after Macron’s victory was announced. In the 10 days before Frenchmen everywhere would cast their vote, Twitter was abuzz with activity. By combing through some 17 million messages tweeted during that time, Dr. Emilio Ferrara, a research assistant professor at USC Computer Science Department reports that a sizable subset can be traced back to Twitter bot accounts hell-bent on spreading a package of false documents dubbed the Macron Leaks — a stash of falsified and doctored documents, photos, and correspondence supposedly coming from Macron and his campaign staff. Ferrara says he tracked these documents from an “email dump” on a popular imageboard 4chan thread two days before the election proper. From here, they got picked up by alt-right activist Jack Posobiec and even Wikileaks, which helped the disinformation campaign gain a lot of exposure. So although bots were heavily implicated, their role was mainly to dupe a few people into believing the contents of the papers. These people, in turn, would do the heavy-lifting of disseminating the information around. For example, the now-deleted bot account @jewishhotjean started off with only 46 followers two days before the election but jumped to 14,033 after just 39 retweets. Another suspended account, @yhesum, went from 21 to 9,476 followers after 291 retweets. But perhaps most troubling is that about one in five of the bots involved in the French election were also active in the U.S. presidential race, suggesting “the possible existence of a black-market for reusable political disinformation bots,” Ferrara wrote in the study. Luckily, however, French users didn’t bite much into the MacronLeak accounts. Although the false documents made headlines for several days in the country, they didn’t have any significant effect on voting trends — French voters overwhelmingly elected Macron over nationalist opponent Marine Le Pen. A lot of people did bite, however. But these users had no say or vote in the matter and were “mostly foreigners belonging to the alt-right Twitter community,” the study notes. That’s why findings such as the ones Ferrera’s team describes here are so important: they show just how easily duped we can be, and how powerful a simple bot armed with fake news can become. The paper didn’t discuss any politics, but a reusal of propaganda bots from the U.S. election seems to confirm some of the patterns security researchers and policy analysts have found in terms of Russia’s involvement in America’s latest presidential race. As Macron has been very critical of the Kremlin, criticizing Russia’s state-run media before and shortly after winning the presidency, the motive seems to be there. Seeing the same groups of bot accounts involving themselves in similar issues through similar patterns is a pretty big smoking gun. But at the end of the day, attributing anything to anyone beyond a shade of doubt is almost impossible in cyberspace. Still, it’s not all bad. Ferrera notes that out of the 15 most active anti-Macron bots, Twitter deleted 4, suspended 7, and quarantined 2. But there’s nothing stoping someone from making a new account and going throguh it all over again — so we should try to improve our chances and educate people to spot fake news for what it is: simple propaganda. The study “Disinformation and Social Bot Operations in the Run up to the 2017 French Presidential Election” can be read here.